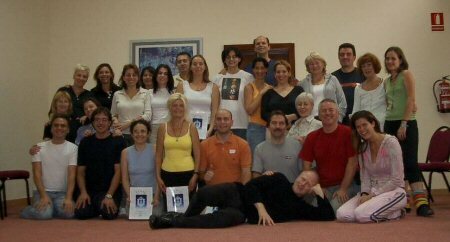 Patrick Zeigler, the founder of SKHM, came to Benalmadena Costa, Malaga, on 23rd and 24th October, 2004, to give the first SKHM workshop ever to be held in Spain. 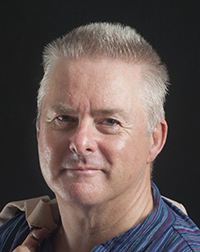 The workshop was co-taught by Michael Heemskerk, from Holland, and it was organised by Graham Crook and Teresa Parrott, who live on the Costa del Sol. When Graham and Teresa attended Patrick’s class in Holland in May, they were very excited to experience the SKHM energy and were keen to bring Patrick over to Spain. There were twenty-eight people in the group, of many different nationalities – Spanish, English, Italian, German and American. People came from Madrid, Valencia, Jaen, Alicante and Ibiza as well as locally – there was even interest from Nigeria! The workshop was taught in English with Graham translating into Spanish. One of the wonderful things about the SKHM energy is that it transcends barriers of language, culture, and belief. Much of the emotional processing that takes place, and the support that members of the group give to each other, occurs at a non-verbal level. For many people, a workshop is an opportunity to express themselves in whatever way they need to, crying, shouting, moving, dancing, laughing. It can come as something of a surprise for people who are expecting a quiet meditation! Every time the group sat down to start a meditation, a few more people introduced themselves, inviting the energy to come in, and the energy was experienced so powerfully that people would go into process and initiations again. It was impressive how quickly the initiations started happening. Some people even thought that others in the group had been planted, and were just acting. Those same people were surprised to find themselves going into emotional processing or spontaneous initiations of their own shortly afterwards! For many people, experiencing painful feelings that they have been holding within them, sometimes for many years, can be frightening. Often, we stop the flow of energy when we try to control what is happening within us. We stay in our minds, rather than allowing ourselves to feel what is happening in our bodies and hearts. Losing control, truly feeling our feelings, is something that most of us fear. The energy flows strongly when we allow ourselves to feel what is happening in our bodies, when we open our hearts, and become consciously aware of the feelings that we have been blocking. People often feel ashamed or embarrassed about acknowledging their innermost feelings to themselves and expressing them in front of others. The important thing about a SKHM workshop is that having accessed painful feelings, the help, love and support from the teachers, facilitators and other members of the group enables a person to express, resolve and heal those painful emotional issues.